Mutant was the studio side-project of Theory In Practice lead guitarist Peter Lake and drummer/vocalist Henrik Ohlsson. The studio project was started originally for both members to get away from the complex instrumentation and songwriting of their main band Theory In Practice. The duo opted for black metal as that genre was as far away imaginable from the music they wrote in their main band. This led to Mutant becoming a straightforward, high-speed black metal outfit that took a good deal of inspiration from the classic Norsecore works of Dark Funeral, Immortal and Marduk. Like the duo’s main band the newer Mutant songs also dealt with cosmic themes, alien lifeforms and government conspiracies, while the old tracks are more typical in terms of subject matter. 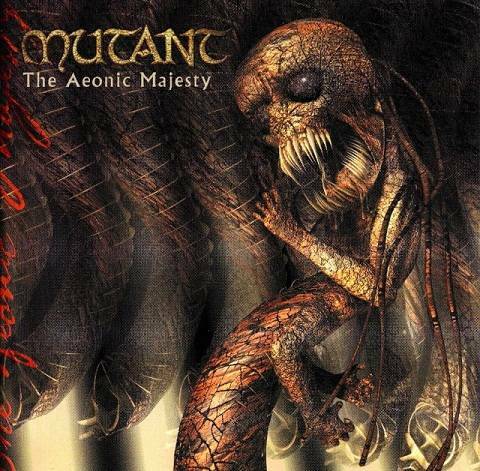 Is “The Aeonic Majesty” a forgotten gem, a lost classic…. or isn't it? “The Aeonic Majesty” doesn’t contain all new material. In fact more than half the record are re-furbished tracks from the band’s independently released 1998 demo “Eden Burnt to Ashes”. ‘The Majestic Twelve’, ‘Premonitions Erupt’, the title track and ‘Immemorial Lunacy’ are entirely new and exclusive to this release. The guitar tone, drum production and bass guitar sound nearly identical to the main band, and while these new cuts are more elaborate, technical and generally more complex in architecture compared to those of the aforementioned demo, they are nothing when looking at the body of work from both men’s main band. Mutant play a slick, digitized and modern interpretation of the classic Scandinavian black metal sound of the mid-to-late 90s – and what they do different is exactly what made them so interesting, even if the sci-fi angle wasn’t new. The keyboards have a prominent place in the glossy production yet they never serve as a lead instrument, as they mostly accentuate and follow the guitars. There are momentary synthesizer solo segments, but for the most part the keyboards are supplemental and only meant to create a haunting and otherworldly atmosphere. All studio drums were programmed and sequenced by guitarist Peter Lake, and thanks to the wonderful production and attention to detail these drums never feel programmed at any time. These digital drums sound very crunchy and organic, and through the incredible precision of its composer the fills, rolls, kick drums and cymbal crashes never feel artificial, not even in the blistering fast parts. The guitar tone and vocal style is similar to Theory In Practice’s third and final album “Colonizing the Sun”, which was to be released a year after this album and side-project. The bass guitar is less present with this record, although this has probably also to do with that it exclusively doubles the guitars. In terms of composition the new tracks are more elaborate and ambitious. ‘The Majestic Twelve’ and ‘Premonitions Erupt’ head into a more technical and midpaced direction, especially the latter. Notable is that the new tracks also integrate emotive leads/solos, which was something that most old tracks avoided. ‘Premonitions Erupt’ actually borders on death metal territory in its slow grinding mid section, the acceleration and the wailing solo only serve to push it farther into that genre. Of the old tracks the H.P. Lovecraft inspired ‘Beyond Bet Durrabia’ stands out with its atmospheric Arabic synths, deformed spoken word, synth flutes and Middle-Eastern melodies. ‘The Aeonic Majesty’ is a much slower track of almost doom-like proportions. The hapsichord solo during this song gives it almost a medieval, or Victorian atmosphere, although the song lyrically has nothing to do with either of these two historic eras. It is a great and unexpected twist. Similarly is the extended bass guitar break in ‘Dark Spheres’ an incredible simple but effective device to break up the incessant blasting from the track as it adds unexpected sophistication and a level of finesse usually sorely missing from the genre as a whole. Mutant wasn’t a typical black metal band in terms of imagery, and that only served to make them stand out from the faceless masses. The digitally rendered artwork by Polish artist Graal is nothing short of amazing. The booklet is beautifully handled with clearly eligible lyrics and production, while the stylized photography of both men exude professionalism and confidence in the material. The remainder of the booklet is adorned by the cover creature in various poses, and spiralling spinal columns which serve as a background image for the typesetting. Even though the lyrics of the older songs are more typically black metal, there isn’t a single pentagram, inverted cross or other such imagery and iconography to be found with Mutant. Which is only logical, because this unit was called Mutant, and the majority of its songs dealt with sci-fi and little else. It is perhaps not surprising that Peter Lake and Henrik Ohlsson decided to lay the Mutant project to rest given the increasingly technical and elaborate nature of much of the new material present on this disc. This material was probably written and compiled in between songwriting sessions for Theory In Practice, who would release their third and final album “Colonizing the Sun” the year after. Had they continued Mutant, it would eventually have led to a watering down of both the main band and the side-project, as both started to share similar compositional traits and idiosyncracies. “The Aeonic Majesty” is a fascinating historical document in the sense that it gives an insight into how people you would normally not associate with black metal interpret it through their own visions and musical baggage. “The Aeonic Majesty” is competent, professionally self-produced, abrasive to a fault and majestic to the core. This album has it all in spades. Is this a great record? Absolutely. Is it vital to own? Your mileage may vary on that.